This is a very simple seafood omelet dish. Using crab meat and patola (luffa or sponge gourd) as filling for the omelet. These two are very nice combination of seafood and veggie. When buying luffa, you should select them young and fresh because the fibers are very tough and chewy if you bought them very mature. And about the crabs, one advantage of making your own crab meat is you are sure that they are fresh, provided that you bought fresh crabs. But the only downside is, it is tedious to remove that meat from the crab shells. Anyway cooking is easy and the result is fantastic when you are already eating and enjoying this dish. To cook crab patola omelet: Boil crabs in 1 1/2 cups of water for 10 minutes. Drain and cool. Remove the meat from the shell and flake. Saute garlic and onion until slightly brown and fragrant. Add the patola and crab meat and stir for a minute. Season with salt and MSG. Stir cook until the patola is done. Beat the eggs and add the patola-crab mixture. Heat about 2 tablespoons of oil in pan then pour in the egg, crab meat and patola mixture. Fry the omelet until firm on one side. Then flip the omelet and heat the other side for a few minutes. 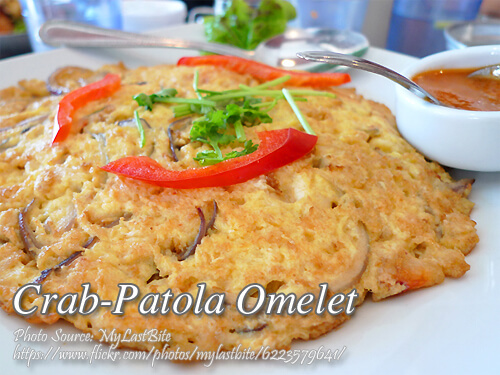 This is a very simple seafood omelet dish. Using crab meat and patola (luffa or sponge gourd) as filling for the omelet. These two are very nice combination of seafood and veggie. Boil crabs in 1½ cups of water for 10 minutes. Drain and cool. Remove the meat from the shell and flake. Saute garlic and onion until slightly brown and fragrant. Add the patola and crab meat and stir for a minute. Season with salt and MSG. Stir cook until the patola is done. Beat the eggs and add the patola-crab mixture. Heat about 2 tablespoons of oil in pan then pour in the egg, crab meat and patola mixture. Fry the omelet until firm on one side. Then flip the omelet and heat the other side for a few minutes. Serve hot with catsup or sweet chili sauce.